In many Western democracies, traditional mainstream political parties are in crisis. They are struggling to respond to rapid changes in the political landscape as voters’ disaffection expresses itself in lower turnouts or rising support for previously peripheral movements.1 The unexpected triumphs in 2016 for the Brexit campaign in the United Kingdom and President-elect Donald Trump’s campaign in the United States are the most high profile indicators of a febrile political environment. But is democracy itself in crisis? Some point out that voters punishing politicians who have failed to represent them adequately is one of the essential virtues of the democratic process. Others argue that the current crisis in mainstream politics goes deeper, fundamentally threatening how politics works. This chapter considers three related reasons to be concerned about the future of democracy: the impacts of rapid economic and technological change; the deepening of social and cultural polarization; and the emergence of “post-truth” political debate. The chapter then looks at three challenges Western policy-makers will have to try to resolve if they are to tackle these issues successfully: how to make economic growth more inclusive; how to deliver the change voters want while maintaining continuity in systems of government; and how to reconcile growing identity nationalism with diverse societies. The chapter concludes that restoring the health of democracy may prove challenging, but some potential ways forward can be identified. The recent increase in support and influence enjoyed by anti-establishment, populist political parties and movements in many Western countries is the continuation of a trend with long roots.2 Anti-establishment populism expresses itself differently in different countries: there are left-wing and right-wing strands, and domestic factors are significant. But there are also common themes: appeals to national sovereignty and criticism that elites have failed to protect electorates from the negative impacts of globalization are threads that run through both left- and right-wing strands. In many cases, there are also appeals to the rights of native citizens, as opposed to immigrants, and the importance of restoring “traditional” values and hierarchies. Numerous factors have been suggested as playing a role in weakening democratic legitimacy and effectiveness. While all related, they can be grouped under three main headings. Statistics show clearly that globalization and trade have created growth, promoted competitiveness and efficiency,5 cut poverty and global inequality, and narrowed the gap between emerging economies and the rich world. 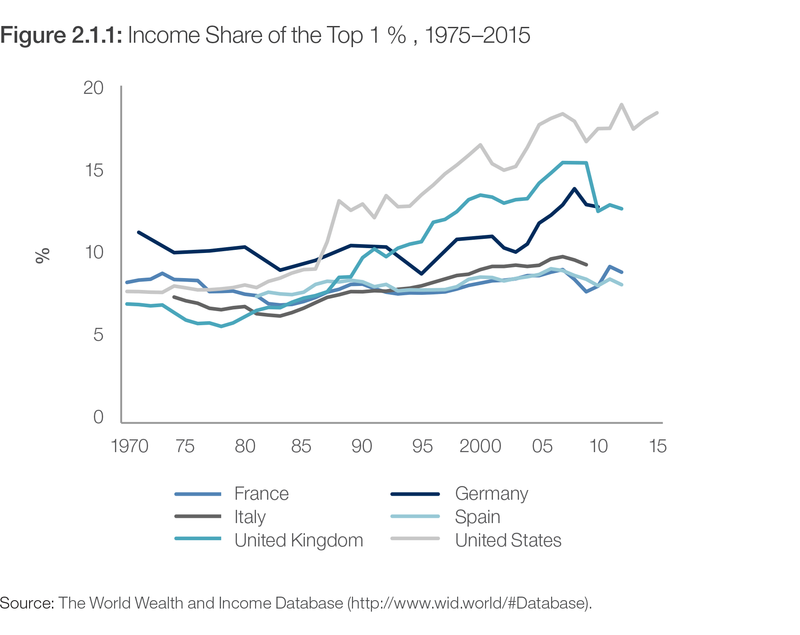 Overall, global prosperity is at its highest point in a decade.6 But globalization and trade feature prominently in anti-establishment sentiment in Western democracies because the benefits of growth have been unequally experienced. Companies that run social media platforms face a commercial incentive to ensure that their users are presented with content with which they are more likely to engage – which, in political terms, implies presenting content with which they are likely to agree.22 If the resulting emergence of self-reinforcing communities of like-minded people undermines the health of democracy, it raises serious questions related to market capitalism reform, an issue discussed in Part 1 of this Report. Social media can liberate, inform, engage, mobilize, and encourage innovation and democracy. However, social media has also changed the way we get informed and form our opinions, with troubling results. According to one recent estimate,1-a approximately 63% of users acquire their news from social media. But news sourced in this way is subject to the same dynamics as other forms of online content, such as selfies and cat photos. It is the most popular content that spreads, regardless of its factual accuracy. This evidence suggests a real possibility that public opinion can be intentionally distorted by exploiting information overload and confirmation bias, with significant political, social and economic consequences. Strategies for mitigation remain uncertain.6-a Google has proposed trying to correct false claims by marking information as fact-checked; but confirmation bias might simply result in the claim of fact-checking being discounted. The problem behind misinformation is polarization – hence, we need to create synergies among institutions, scholars and communicators to reframe and smooth contrast in the information system. There is no consensus on what needs to be done to strengthen democratic processes, but three dilemmas can be identified as particularly significant. The availability of good, well-paying jobs is critical to persuading people that the economic system works for them. Evidence shows that there is no trade-off in principle between promoting social inclusion and competitiveness: growth and equity can go together.23 Governments can, in theory, deploy various tools, policies and institutions to make growth more inclusive. However, in practice, the current environment presents some serious challenges. Technological change is diminishing the contribution of labour to GDP growth, as machines become more able to do a wider range of work. One study predicts that 47% of US jobs are at risk of automation,24 affecting over 80% of low-income workers.25 New technology has also historically increased labour productivity and created new and better jobs – but as machines become better at cognitive as well as physical tasks, there is significant uncertainty about the future of job creation. Technology is also contributing to the changing nature of work, with secure and predictable jobs giving way to more sporadic, short-term self-employment.26 Research suggests that the number of people in “alternative work arrangements” increased faster than overall employment between 2005 and 2015.27 The rise of the “gig economy” threatens the stability of income people need to plan long-term investments such as home ownership and savings for old age. As discussed in Chapter 2.3, it also undermines social insurance schemes that are commonly linked to formal employment. Populist movements tend to focus blame for job losses on globalization rather than technology, but evidence points to technology being much the bigger factor. 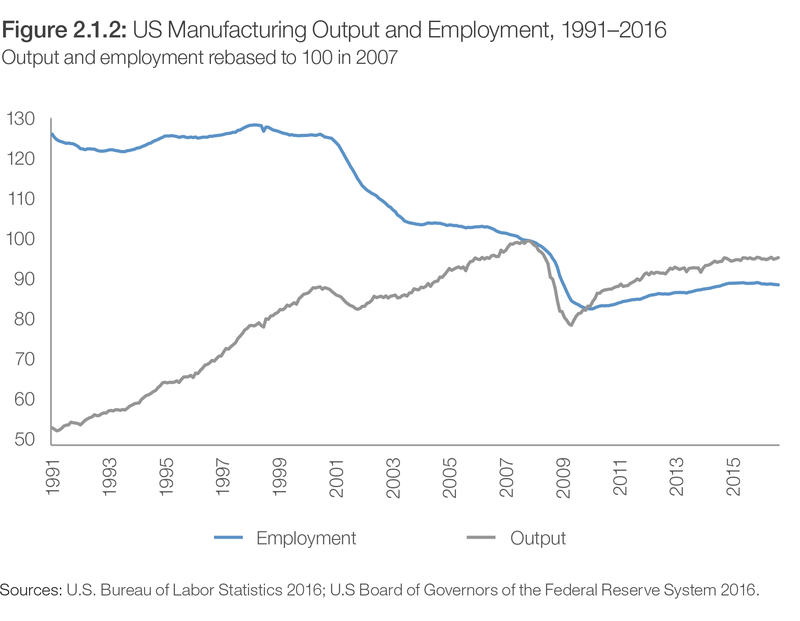 As shown by Figure 2.1.2, manufacturing in the United States has not decreased: the country is producing as much as it ever has, only with fewer workers. In the United Kingdom, the share of manufacturing in the economy has decreased – but the manufacturing that remains is higher value,28 and cross-border services have massively expanded in parallel. Less openness is presented as a simple solution, but it would likely create more problems than it solves: trade barriers intended to protect local workers could, for example, cause job losses by increasing the cost of inputs for high value added companies. decades.31 This has enabled once-fringe movements to rise by portraying the established parties as part of the same technocratic political class, focused on self-enrichment while the institutions of government are allowed to fail. Populist movements call for bold, dramatic action; when moderates point to public debt and overstretched monetary policy as constraining room for manoeuvre, they can be portrayed as patronizing. The challenge is to deliver the short-term change voters demand, while also reforming institutions in a way that maintains the continuity of government and established checks and balances. Arguably, the US election result demonstrated a paradox: voters who responded to candidate Donald Trump’s “drain the swamp” message often also expressed reservations about his personal suitability for the presidency, implying that they trusted the existing system to be robust enough protect them from potential excesses even as they voted to shake that system up.34 Finding the right balance between change and continuity will not be easy. An increasingly common response to popular disaffection with the political process has been for elected representatives to defer to referendums: the UK vote on EU exit was one of a spate of plebiscites in 2016. However, these are an imperfect solution. Representative democracies have typically evolved mechanisms to protect the rights of minorities from crude majoritarianism, and increased use of direct democracy may upset the balance. Countries that lack a historical tradition of direct democracy may also be more likely to struggle with the question of who should be held accountable for implementing the results of popular votes. Ongoing humanitarian challenges will continue to create flows of people – and in countries where fertility rates are declining and numbers of pensioners are growing, immigration will be needed to bring in new workers. However, as with globalization, the overall economic benefits brought by immigration are not felt by all sections of society. And immigration creates cultural tensions: there is a need to allow space for religious tolerance without opening the door to extremism, and a need to encourage the diversity that brings innovation without fostering resentment. In Western democracies, political parties are the traditional mechanism for resolving competing interests,36 but the rise of identity nationalism has exposed splits in society that cannot be mapped against existing party structures. This raises the need to find new ways to reconcile differences in opinion about immigration, encouraging assimilation while avoiding the risk of majorities – which represent the prevailing culture – flexing their muscles in a dangerously destabilising way. Leaders will need to face up to a debate over how to allocate economic and residential entitlements to economic migrants and refugees. Some countries may want to link these entitlements to cultural assimilation or work, treating native populations and migrants unequally: the latter have to earn the rights that are fundamental to the native population’s citizenship. Other countries – this was an important driver of the United Kingdom’s Brexit vote – may choose to loosen their international economic ties in order to slow the pace of immigration. There is room for debate about the extent to which the rise of anti-establishment sentiment in Western democracies reflects a threat to the democratic process itself. Nonetheless, there are clear reasons to worry about the health of democracy, and challenges related to cultural polarization and economic dislocation have no straightforward answers. This could be a pivotal moment in political history, and it requires courageous new thinking about how best to manage the relationship between citizens and their elected representatives. Chapter 2.1 was contributed by Stefan Hall, World Economic Forum, and Ngaire Woods, Blavatnik School of Government, University of Oxford. Ciampaglia, G. L., P. Shiralkar, L. M. Rocha, J. Bollen, F. Menczer, and A. Flammini. 2015. “Computational fact checking from knowledge networks”. PloS one 10 (6): e0128193. Cramer, K. J. 2016. The Politics of Resentment: Rural Consciousness in Wisconsin and the Rise of Scott Walker. Chicago Studies in American Politics series. Chicago and London: The University of Chicago Press. Dabla-Norris, E., K. Kochhar, N. Suphaphiphat, F. Ricka, and E. Tsounta. 2015. “Causes and consequences of income inequality: A global perspective”. IMF Staff Discussion Note SDN/15/13. Washington, DC: IMF. Del Vicario, M., A. Bessi, F. Zollo, F. Petroni, A. Scala, G. Caldarelli, H. E. Stanley, and W. Quattrociocchi. 2016. “The spreading of misinformation online”. Proceedings of the National Academy of Sciences 113 (3): 554–59. Hill, S. 2015. Raw Deal: How the “Uber Economy” and Naked Capitalism Are Screwing American Workers. New York: St. Martin’s Press. Inglehart, R. 2016. “The danger of deconsolidation: How much should we worry?” Journal of Democracy 27 (3): 18–23. Inglehart. R. F. and P. Norris. 2016. “Trump, Brexit, and the Rise of Populism: Economic have-nots and cultural backlash”. HKS Faculty Research Working Paper No. RWP16-026. Cambridge, MA: Harvard Kennedy School. Mocanu, D., L. Rossi, Q. Zhang, M. Karsai, and W. Quattrociocchi. 2015. “Collective attention in the age of (mis) information”. Computers in Human Behavior 51:, 1198–204. Sunstein, C. R. 2002. “The law of group polarization”. Journal of Political Philosophy 10 (2): 175–95. Zollo, F., P. K. Novak, M. Del Vicario, A. Bessi, I. Mozetič, A. Scala, . . . and W. Quattrociocchi. 2015. “Emotional dynamics in the age of misinformation”. PloS one 10 (9): e0138740. 2 Inglehart and Norris 2016. 3 Aisch, Pearce, and Rousseau 2016; The Economist Data Team, 2016. 4 See Foa and Mounk 2016 in their article “The danger of deconsolidation: The democratic disconnect” in Journal of Democracy and the response in the same issue by Inglehart. 5 Dabla-Norris et al. 2015. 9 Dobbs et al. 2016. 10 Dabla-Norris et al. 2015. 14 Halla, Wagner, and Zweimüller 2015. 19 Benton 2016; Waters, Garrahan, and Bradshaw 2016. 21 Del Vicario et al. 2016. 22 Del Vicario et al. 2016. 1-a Newman, Levy, and Nielsen 2015. 2-a Quattrociocchi, Scala, and Sunstein 2016; Del Vicario et al. 2016. 3-a Zollo et al. 2015; Sunstein 2002. 4-a Mocanu et al. 2015. 5-a Quattrociocchi, Scala, and Sunstein 2016. 6-a Ciampaglia et al. 2015. 23 Samans et al. 2017. 24 Frey and Osborne 2013. 27 Katz and Krueger 2016. 30 Kuddo, Robalino, and Weber 2015. 33 Abernathy, Konczal, and Milani 2016.